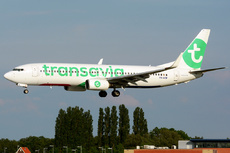 Transavia flight HV6729, a Boeing 737-800, issued a fuel emergency following a diversion and go around at Málaga Airport, Spain. The aircraft operated on a scheduled flight from Amsterdam, Netherlands, to Sevilla, Spain. It departed Amsterdam at 09:26 with 6 crew and 171 passengers onboard. The aircraft flew standard terminal arrival route HIJ3F into the Sevilla Airport, as assigned. At 11:56, when the aircraft was between points BETIX and TENDU, which is the initial approach fix (IAF) for the approach to runway 09, the approach controller called the aircraft to inform the crew that an aircraft was stopped on the runway, meaning the runway was currently not available. The controller asked the crew to circle left and said he would call them right back. The aircraft that was blocking the runway at the Sevilla Airport had sustained a flat tire during the landing and was stopped on taxiway E3, between the runway and the holding point marking. The aircraft was unable to move by itself and required assistance from the Rescue and Firefighting Service (RFFS) to move. At 11:56, the controller again contacted the crew, instructing them to circle again at an altitude of 2000 ft, once more telling them that he would call back with more information as soon as he could. At 11:59, the crew called the controller to ask if they would have fly another 360º circle (the third), which the controller confirmed. As they were finishing the third circling maneuver, the crew received a call from the controller, who told them that work to remove the aircraft would be delayed at least ten more minutes. The crew replied they did not have enough fuel to wait that long and that they wanted to go divert to the Málaga Airport. The controller gave them instructions to proceed to that airport, informing them that runway 13 was in use. The crew flew the aircraft to the Málaga Airport, completing the terminal arrival route and then commencing the ILS approach procedure to runway 13. In the meantime, an ATR 72-500 aircraft, registration EC-LYJ and operated by Swiftair, was preparing to carry out flight AEA5036, from Málaga to Madrid. At 12:24, the crew of this aircraft were cleared to taxi to the runway 13 holding point, which they reached at 12:30. The crew then called the control tower to report they were ready for takeoff. The controller replied, "Hold short, traffic on final, I’ll call you back". The crew acknowledged "Line up and wait runway 13", and started taxiing into the runway. The controller replied "negative" to warn of the incorrect acknowledgment of the instruction, repeating "Traffic on final, hold short runway 13". The crew of aircraft AEA5036 replied they were holding short of the runway. The controller asked the crew to confirm the runway was clear. The crew reported they had taxied over the holding point marking by only one meter. At 12:31, with HV6729 just over 1 NM out from the runway 13 threshold, the tower controller at the airport instructed the crew to go around because a traffic had crossed the holding point marking. The crew acknowledged the instruction and added they were low on fuel. At 12:33, in contact with approach, they confirmed they had reached 2400 ft on runway heading, and when they were instructed to turn left heading north and climb to 4000, they declared an emergency ("MAYDAY MAYDAY MAYDAY") due to low fuel. The controller acknowledged the message and instructed the crew to descend and join the left downwind leg for runway 13. They were subsequently cleared to make a visual approach and finally landed at 12:39. Fuel remaining on landing was 900 kg. The incident was caused by the successive delays introduced into the flight for reasons beyond the control of its crew. - The inefficient handling of the incident that caused the closing of the runway at the destination airport, in terms of the exchange of information between the stations involved and the lack of a realistic time estimate for a return to normal operations. - The misinterpretation by the crew of the aircraft with callsign AEA5036 of the controller’s instruction, which resulted in that aircraft’s runway incursion.